Check out the first in the new series at Nola Cuisine, Great Chefs of New Orleans, the first being Austin Leslie. 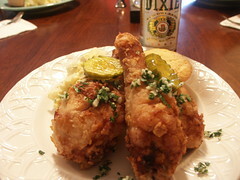 In addition to the bio we will also feature a recreation of a recipe the Chef was most famous for, in this case, Austin Leslie's Fried Chicken Recipe (pictured). My Tasso Recipe with a picture.